How can we ease users’ tran­si­tion from the real sur­round­ings into the vir­tual world? Many of today’s vir­tual real­ity (VR) setups are very much focused on tech­ni­cal aspects rather then the ben­e­fits of a coher­ent user expe­ri­ence. 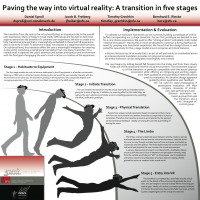 This work explores the idea of enhanc­ing the VR expe­ri­ence with a tran­si­tion phase. On a phys­i­cal level, this tran­si­tion offers the user a mean­ing­ful metaphor for enter­ing a new world, mim­ic­k­ing a real phys­i­cal trans­la­tion from one place to an– other. On a mental level, it cap­tures the user’s atten­tion and evokes antic­i­pa­tion and involve­ment with the final goal of engag­ing the user’s mind in active co-creation of the expe­ri­ence. We present a con­cep­tual model of a 5-stage tran­si­tion and describe an imple­men­ta­tion we are cur­rently devel­op­ing, includ­ing pos­si­ble eval­u­a­tion procedures. 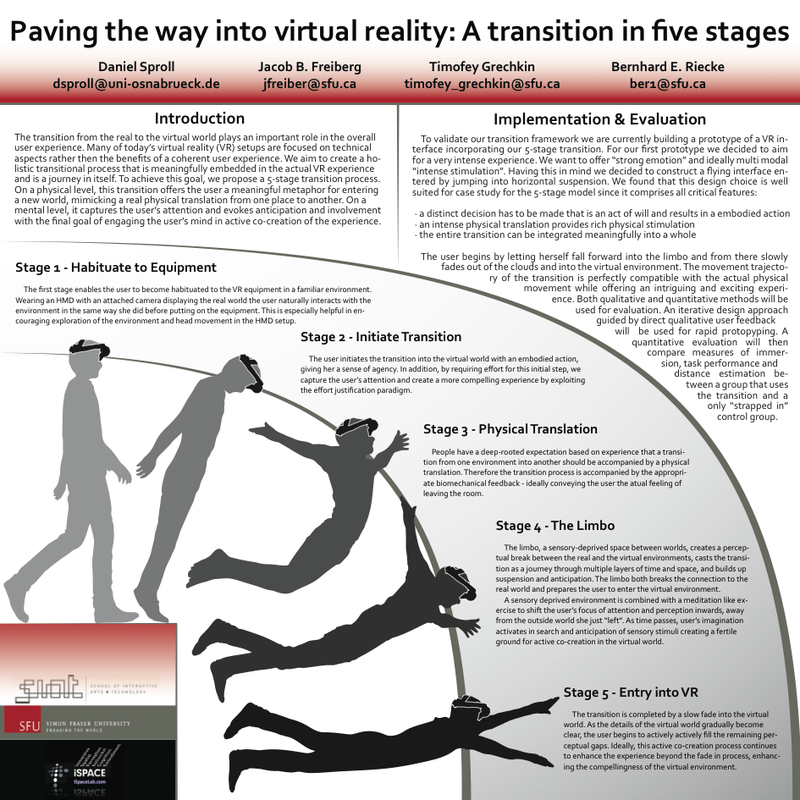 For first pub­li­ca­tions for this project take a look at our IEEE VR 2013 poster and the two page abstract. Earlier ideas and pro­to­types can be found here, from the TransLocation project that Bernhard was advis­ing while work­ing in the VR group (Cyberneum) at the Max Planck Institute in Tübingen, Germany.